Guess which empire came to an end today? In the early 16th century, a priest by the name of Fray Francisco de Ugalde remarked to his king that Spain was “el imperio en el que nunca se pone el sol”. In other words, the sun never set on the Spanish Empire. And by the 1500s with its vast lands across the Americas, Africa, Europe, Asia, and even the South Pacific, Spain (technically the House of Habsburg) had become the first truly global superpower. The Empire’s status was so great that its silver coin (the real de ocho or piece of 8) was used around the world as a global reserve standard… including in the US colonies. Like so many great empires that came before, Spain was beset by unsustainable spending, constant warfare, debilitating debt, and an inflated money supply. By the mid 1500s, the Spanish government was spending 2/3 of its total tax revenue just to pay interest. Spain defaulted on its debt six times in the next century. It finally came to an end on today’s date in 1643, exactly 371 years ago. Historians can literally circle the date on a calendar that Spain ceased being Europe’s dominant superpower; it was the day that Spain lost the Battle of Rocroi, and effectively the Thirty Years War against France. Just days before, a four-year old Louis XIV had ascended to the throne to become the King of France after the death of his father. And during his whopping 72-year reign, France replaced Spain as the global superpower. For more than a century, commerce, art, and technology flourished in France. And some of the greatest intellectual minds in history published their works during this period. I remember being told as a West Point cadet that in the early days of the Academy in the 1800s, the only two classes were French and Mathematics, primarily because all of the great textbooks were written by French mathematicians. France had public healthcare and free hospitals. Great monuments to their grandeur. Colonies around the world. An awe-inspiring military. And their influence was so great that foreign governments from Russia to Prussia spoke French internally. Needless to say, this didn’t last either. And like the Spanish before them, France overspent, overexpanded, and overregulated. They waged excessive warfare, and they managed their affairs as if the good times would last forever. By the 1780s, the French debt had grown so much that they were rapidly devaluing the currency and borrowing money just to pay interest on what they had already borrowed. Like an aging prize fighter, there is no nation that can permanently maintain its status as the dominant superpower. And certainly no nation that can defy universal economic truths. Powerful nations believe they can borrow indefinitely and dilute their currencies without consequence. This simply isn’t true. Wealth and power shift. 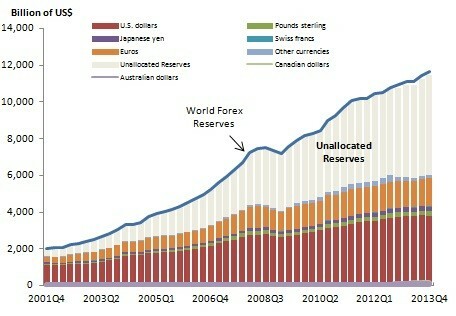 The world’s reserve currency changes. It’s been happening for centuries, and this time is no different. We are all witnessing this change unfold again. And this isn’t some wild assertion. Objective data from the Bank for International Settlements and the International Monetary Fund all show a clear decline in the dollar’s share of global reserves. The US government’s own data shows a net worth of minus $16.9 trillion, over 100% of GDP in the red. And even in their most optimistic projections, the government tells us that growth in debt will outpace growth in tax revenue. Day to day, it’s easy to ignore these trends. But from a big picture perspective, it couldn’t be more obvious. Perhaps it’s happened already. Or perhaps it will occur in a war yet to be fought. But if history, common sense, and truth are any guides, that reckoning is quickly approaching. Pimco’s Bill Gross tweets Gross: The debt rock of Sisyphus can never reach top of the hill. You can’t solve debt crisis w/ more debt. Growth, inflation or haircuts. At the start of May 2012, crude oil headlines shouted “$150 Per Barrel” and “High Oil Prices Here to Stay”. Now, 30 days later, crude oil prices are 17% BELOW their May 2 peak. Facebook closed the month at $29.60, down $8.40 (-22%) from its IPO price and down $15.60 (-34%) from its all debut high. And we said when the IPO was first announced: “social mood is still quite ebullient and using that ebullience to cash up is a smart move for the owners.” It certainly has been in the first month as the market brought the stock back to a more realistic level.